What do the SATs results mean for your child? With the SATS results being released, many parents are asking what they mean for their child. In reality, the intention of the SATs exams is to allow school performance to be measured. However, they are also often used for assessing a child’s current ability and how they might affect a child’s future placement in sets at secondary school. Not all secondary schools will use the SATs score purely, with some operating their own year 7 tests. Coincidentally the type of test children often sit at the start of Year 7 known as the MidYIS test is created by the same organisation who set the 11+ called the CEM (Centre for Education and Monitoring, www.cem.org). Children at the end of year 2 take the key stage 1 (KS1) test. Towards the end of year 6, pupils then take key stage 2 (KS2) tests. 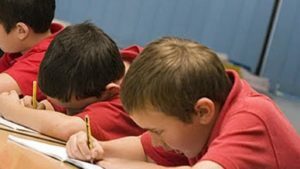 The KS1 test is for children who are either 6 or 7, covering their maths, reading and grammar. The raw score they get is then converted into a scaled score which is then used to compare them to their peers. Teachers convert the scores using tables which can be found on government websites. The highest possible score is 115 and the lowest is 85. If a child scores 100 or more, this means they are meeting the expected standard. Lower than this means they are not at the expected standard. KS1 tests are written externally but they are marked by teachers within the school. This is monitored to ensure that teachers are not unnecessarily increasing pupils’ scores. Unlike KS1, the KS2 test is both written and marked externally. This is a significant metric in measuring school performance. Following the abolition of the National Curriculum levels in 2016, children began receiving a scaled score. As with KS1, the raw score is translated using specific tables. The tests are different each year, which means that the difficulty can change. This is why the raw data can’t be used to assess pupils performance over time. Again, 100 or more is the national standard and under this means that the child hasn’t met the required standard. The maximum score is 120 and the minimum is 80. 61% of pupils met the expected standard for reading, writing and maths this year. Are parents notified of the results? Your child’s school will decide if you will get the results of your child’s SATs tests. For KS1, you may have to ask the school for the information. However, most schools will let you know whether your child is currently at the expected standard. KS2 children will usually receive their results with their school reports at the end of the term. Children will be told if they have achieved the national standard score. It is likely that you will be informed of their scaled score, rather than the raw score. If you’ve received notification and you want to know exactly what it means, please get in touch with us here. Four Key Grammar School FactsSATs results: Have they improved since last year?